According to the latest tabloid report, Kim Kardashian is gearing up to steal the wedding spotlight from Miley Cyrus and Liam Hemsworth. 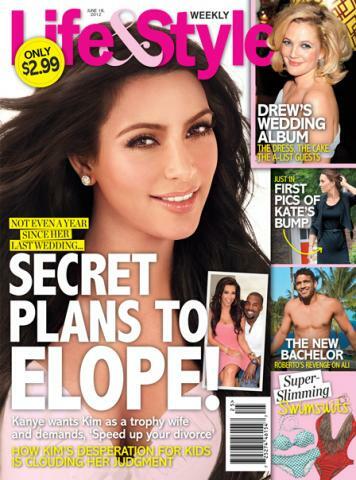 Life & Style reports the reality star and her rapping new man are making "SECRET PLANS TO ELOPE," with Kanye West pressuring Kim to finalize her divorce from Kris Humphries so they can become husband and wife. "Kanye wants to marry Kim, and he's telling her to expedite the divorce so they can start their future," a Kardashian insider tells the tabloid. "Kanye's like, 'Just do whatever you need to do to make it go away.'" We might find out more about what that entails in a couple weeks when Kim and Kris give depositions in their ongoing legal battle. "As things get more and more intense and comfortable, both Kim and Kanye hate being apart. And as they grow closer, Kanye's desire to marry Kim - and hers to be married to him - keeps getting stronger." Do you think these two should get hitched?